Odisha Coal / Power Limited has published a job advertisement regarding OCPL recruitment. In order to fill 28 vacancies of senior manager, junior overman, junior male nurse in different trades, online applications are invited from skilled and well-qualified persons. Job seekers who want to apply for OCPL jobs. They can fill online applications by the last date till 27 January 2019. Those seeking job seekers can get full details of OCPL recruitment 2019 from this page which is available for your convenience by the team of www.telanganaa.in. The age of the claimants should be between 01-01-2019 between 21 to 50 years (post 1), 21 to 45 years (post 3-11), 21 to 35 years (post 12-15). Salary details: The claimants selected after the selection process are eligible for Rs. 78,800 - 2,09,200 / - (Senior Manager), Rs. 67,700 - 2,08,700 / - (Medical Officer, Senior Assistant Manager), Rs. 56,100 - 1,77,500 / - (Assistant Manager / Technical Assistant), Rs. 35,400 - 1,12,400 / - (Junior Overman / Junior Foreman), Rs. 26,400 - 83,600 / - (Junior male nurse) According to the organization's norms. Candidates who wish to apply for OCPL vacancies must go through the official website of the website http://www.ocpl.org.in. Take a printout of the submitted application form and send the application with the documents to the address given below. Closing date for submission of application: 02-02-2019. Click OCPL recruitment notification here. 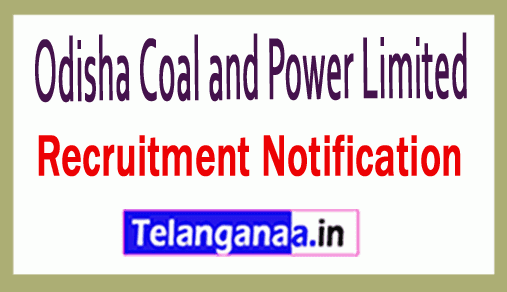 Odisha Coal and Power Limited has posted a vacancy for OCPL Recruitment. Qualified and motivated jobseekers can submit their prescribed application form for the 2 vacant positions of the Managing Director, the Deputy Managing Director before the end date, which is 1 August 2018. Participants wishing to apply for this vacancy in OCPL Jobs can access all the details of OCPL Recruitment 2018 on this page created by the team www.telanganaa.in. Qualification criteria: Jobseekers should have completed training as MBA / PGDM (Human Resources / HR / Industrial Relations) / Master (Geology) / Postgraduate (Social Welfare / Labor Welfare / Industrial Relations / Human Resource Management) with good university / institute academic records as applied Positions are recognized. Applicants will be recruited against this recruitment based on their performance in the telephone interview / personal interview conducted by the selection committee of the recruiting organization. Visit the web portal of the organization http://www.ocpl.org.in. The start date of the online application is: 18.07.2018. The online registration of the application form ends on: 08-01-2018.